A change of pace, or not — Jg. I know that the blog has resurrected itself a bit these past few weeks, and that should continue, but I also expect the flurry of posts to slow for the next few. I'm in the midst of revising a first draft of my next book, which I'm due to deliver in early August. I've taken a week off from work to get things off to a banging start, and so far, it's been that. Here's to sustaining that energy for the rest of July, despite the heat and the holidays and the Squish on summer break. Squish, finishing her mug rug. Yes, she's working from a classic Star Trek project bag, which Felicia made for her. To leave you with a fun story, however: This past weekend, a friend of ours came to visit. She's an airline pilot, and now and then she's got reasons to spend a day or two with us. Squish is always quite excited about this, as Linzee (the friend; keep up) deals out the most rib-crushing hugs. Linzee arrived late Saturday night, after Squish had gone to bed, and Sunday morning, when she learned that Felicia and Linzee would be hanging out in Portland all day, Squish was a bit deflated. 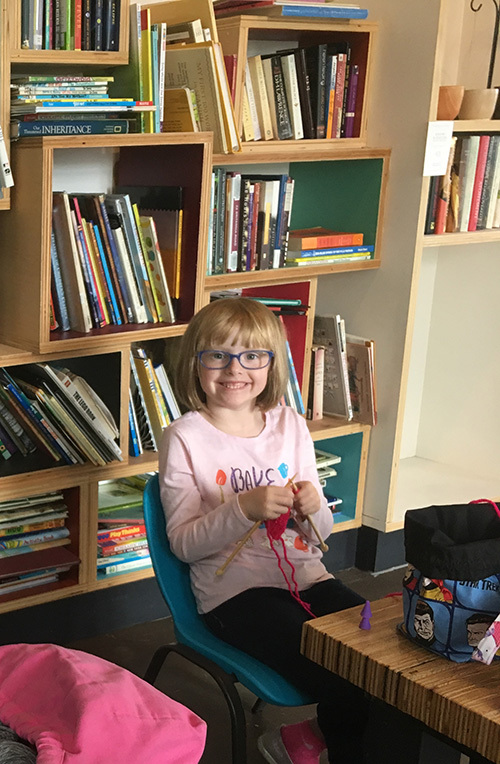 So: before the great Portland hangout began, Felicia and Linzee brought Squish to our local coffee shop for a little knitting hangout first thing Sunday. While there, Squish finished her first-ever knitting project, a little "mug rug" she's been working on here and there for a few months. After that little shindig—and knowing that I'd be a distracted mess for whole swaths of July—I decided Squish and I needed a little hangout time of our own. So I packed her off to the Oregon Museum of Science and Industry (OMSI) for the Robot Revolution exhibit. A mild stumble as we entered: one of the kind old museum guides noticed Squish's shirt (which reads Bake the world a better place) and said, "Does she prefer pastries or pies?" Which Squish didn't hear, since her ears exist at a lower plane of the physical world than do adult mouths, and which I completely had no context for, since I've seen Squish's shirt a dozen times and never once used it to define her. "What?" I asked the employee, who repeated her question. I stood there, bewildered: "What?" The employee—a kind and grandmotherly type—recognized my complete addlement and shooed us along: "Never mind, dear, please go on inside." I put two and two together about, oh, four hours later. Thespian-bot, who swears he isn't here to hurt us. The robotics exhibit was a blast for Squish, who met a robot-on-wheels named Omron as soon as we entered. Omron promised to guide us around the exhibit, and did, slowly using "her" optical sensors to navigate the crowds. Squish was hooked immediately, and paced Omron, listening intently to her garbled robot voice try to explain the purpose of this exhibit or that. Squish was too kind to point out that she couldn't understand a word Omron was saying; she's a good kid. She was fascinated to learn that Omron was guided by her optical sensors; Squish just spent a week at Camp Invention, and one of the robots she brought home from camp was a tiny little "optibot," which navigates the same way, and will follow a track if you lay one out. Her favorite bits of the exhibit were a push-up performing bot in a Chicago Cubs uniform, and a "thespian" bot who loudly and quite formally declared that robots are not here to harm people or change our way of life in any way but for the better. "You see that pink thing in the back of your mouth?" "You mean the hangy thing? That's a uvu—"
"No, no. The pink wall. It's kind of squishy?" "Yeah. It's, like, a pink wall, and your food goes through it and, like, dissolves." "Do you mean the back of my throat?" "That pink wall is just the back of my throat. Food actually goes down, not through." "Oh. I guess I must have been thinking of a whale shark or something?" That whole bit made me laugh, which made her laugh, and then she said, "Sprinkles!" I asked what in the world she was talking about, and she said, "Um, you made sprinkles of snot come out of my nose." That night, after we read Wrinkle and turned out the lights, Squish rolled over onto her tummy and whispered, "Dad, we're going to have secret science classes, right?" Secret science classes? "Yeah, you're going to get us a telescope and teach me where to find the big dipper and the little one and the north star and stuff, right?" Why secret? "Because I'm going to surprise you and be a scientist, of course." It's going to be hard to spend July focused on writing when this most awesome little girl is hanging around with not-that-much to do. I might fail at my writing plans entirely, just to make sure we find a telescope and a few dozen constellations.